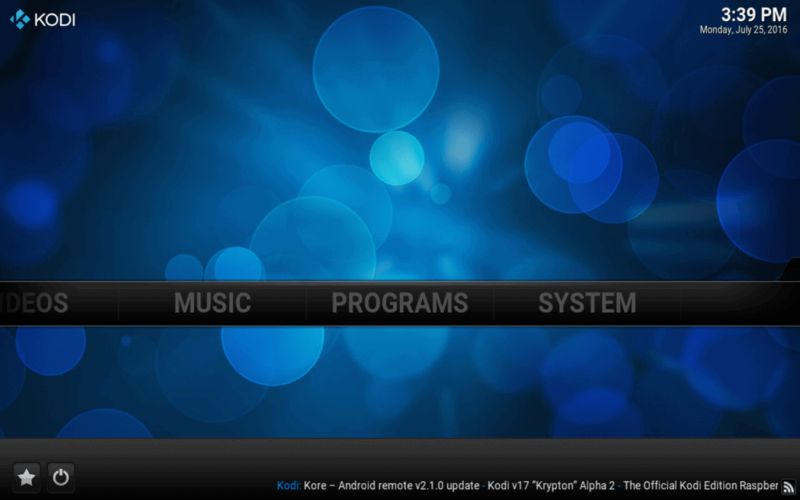 Kodi is a free, open-source home theater software that runs on multiple platforms including Windows, Mac OSX, iOS, Android, Linux, and Raspberry Pi. It can be used to stream media from the internet or play local files. Kodi is source-agnostic, and it has a ton of official and unofficial add-ons to stream everything from Netflix to torrents to live sports. While anyone can use Kodi, the channels it pulls content from are still limited to the same restrictions as they would be in a web browser or native app. Content from Netflix or BBC iPlayer, for instance, could still be restricted depending on your location. Likewise, streaming video from torrents is just as illegal as if you downloaded the files onto your hard drive or streamed them on Popcorn Time. To protect your privacy when using Kodi, we recommend you use a VPN. A VPN encrypts all the traffic traveling to and from a device before routing it through a server in a location of the user’s choosing. This allows users to “spoof” their location and get around firewalls that filter users based on their location. Furthermore, the encryption prevents the user’s ISP and any other authority from viewing the content and destination of their internet traffic. This makes VPNs vital to people who stream or download torrents and/or use any other unsanctioned sources for licensed content. Additionally, some Kodi add-ons can get hijacked by third parties. When that happens, the add-ons and those behind them can get access to your computer through man-in-the-middle attacks and other forms of hacking. Using a VPN will help secure your system against MITM attacks and other forms of privacy invasion through Kodi. Not all add-on hacking can be prevented by a VPN, however, so you will want to use some caution when using Kodi add-ons. A smart DNS proxy works similar to a VPN in that it routes the device’s internet traffic through another location, but it lacks the encryption of a VPN. This makes it a viable choice for watching geo-locked content, but it is not private enough to protect torrenters. Note that many streaming video services–Netflix, in particular–actively block proxy users including both VPNs and smart DNS. For that reason, our best recommendation is to use a paid VPN service like ExpressVPN, which always has a few servers that can access Netflix without getting the proxy error. You can get 3 months extra free here with all 12-month ExpressVPN plans. If you’re not bothered about Netflix, IPVanish is a popular option with Kodi users as it scores highly for both privacy protection and speed and works with all Kodi add-ons. How you set up your VPN to work with Kodi depends largely on your operating system. You can either install an add-on to enable the VPN within Kodi, install a native VPN app outside of Kodi, manually set up a VPN using the built-in settings on your operating system, or manually setting up the VPN on a router. We’ll lay out all the options for each major operating system here. You might also want to check out our list of the 10 best VPNs for Kodi. We lumped Windows, Android, and iOS all into one category because when it comes to running Kodi over a VPN, they all work pretty much the same. As far as we can find, developers have not yet come up with an add-on that allows users to access and control the VPN from within the Kodi interface for these operating systems. Instead, users of these three platforms can install the native app provided by their VPN provider onto their operating system. Once installed and signed in, just connect to the VPN and let it run in the background. All of the streaming traffic to Kodi will be routed through the VPN server and encrypted. We recommend this route because 1) it’s easy and 2) most modern VPN apps use the OpenVPN protocol, which is the most secure option. If your VPN provider doesn’t have an app or you just don’t want to use it, you can find manual setup options somewhere in the settings. Here you are usually limited to the L2TP, SSTP, and PPTP protocols. Of those options, we suggest L2TP or SSTP, as PPTP has well-documented security vulnerabilities. The one exception, if you’re really intent on controlling the VPN from inside Kodi, is VPNicity. VPNicity is a VPN service specifically made for Kodi users that functions as a program add-on. It runs on a wide range of operating systems and devices, but it doesn’t come free. A monthly subscription starts out at $5.99 per month, and a 7-day free trial is available. With so many other quality VPNs out there that run with or without Kodi–many at lower prices–it’s a tough sell. But we promised to give you all the options so… there you go. Kodi users on Mac OSX have all of the options above plus one more: an add-on that allows Mac users to switch the VPN on and off from within the Kodi interface. We recommend this OpenVPN add-on from developer Brian Hornsby. It’s open-source and doesn’t require installing any extra repositories or add-ons. Once installed, the OpenVPN add-on will appear in your Programs menu. You’ll need to download the OpenVPN configuration files from your VPN provider and import them into the add-on. That only needs to be done once for each server, then you can control the VPN right from the menu. The options are sadly very limited for Android-based set-top streaming media boxes like Fire TV, Roku, and Chromecast. Most (all?) VPN providers don’t bother making apps for STBs, and they usually don’t even come with built-in support for manual setup. Again, there’s the VPNicity option, but… meh. So here we’ll suggest another option: set up the VPN on your wifi router. This means all the internet traffic from every device in your home or office will be sent through the VPN (unless you buy a separate router just for your Kodi device). That can be a good or bad thing, depending on if you like to be on the VPN all the time and how reliable the VPN server is. The process differs depending on the firmware of your router. ExpressVPN has setup tutorials for most types here. For once in their lives, Linux users get more options than anyone else. If your VPN provider offers an app, you can use that to connect outside of Kodi. Check out our list of the best VPNs for Linux here. Some Linux distros come with the open-source OpenVPN client pre-installed. If not, getting it is as simple as typing a few lines of code into the command line. Then there’s the add-ons that allow you to control the VPN from within Kodi. Linux users have a few options here depending on the distro. We still favor Brian Hornsby’s solution, which should work on pretty much every version of Linux, as it comes with no strings attached and doesn’t require installing any other add-ons or repositories. If that doesn’t cut it, you could try this one by Stefan Saraev, though you might need to add and configure some other add-ons from TVaddons’ Fusion repository or SuperRepo to get it set up. Saraev’s solution works with OpenELEC devices. Kodi works best with a good VPN such as IPVanish, however, if you want to go down the smart DNS route here’s how to get set up. Smart DNS proxies, like VPNs, can be controlled both from within Kodi and outside of it. The in-Kodi solutions we know of are cross-platform, meaning they work on all operating systems that run the newest version of Kodi (Isengaard, as of time of writing). Smart DNS does not encrypt your traffic, which makes it faster but less secure. The downside is that it is much easier for streaming sites like Netflix to block smart DNS compared to VPNs, so we can’t guarantee they’ll always work. Smart DNS services typically don’t have as wide of a selection of server locations as VPN services. The most popular smart DNS proxy for Kodi is Unblockr, which makes both the add-on and provides the service. Plans start out at $2.63 (GBP 2) per month, and a one-week free trial is available. The best thing about Unblockr is that the add-on automatically updates the your IP address so you don’t have to manually update it. After signing up, you can find instructions for installing Unblockr here. Unblockr is the only add-on we could find for Kodi (let us know in the comments if you know of another one), but if you already subscribe to another smart DNS service, you can set it up in your device or wifi router settings. Most set-top streaming media boxes and smart TVs don’t allow users to modify their DNS settings, so going through a wifi router may be the only option. Any help or information on non-windows split-tunneling? I use Kodi on a linux box, and both stream and use a local library on a NAS. So far I can’t find a solution that allwos me to do both on Linux, just windows and mac. One, pureVPN says it can do so on android, but they’re also reported as having sold logging data to authorities, so I’m not inclined to try them. ExpressVPN does split tunneling on Mac. You can do it on routers with the proper firmware on a router (TomatoUSB and DD-WRT both support split tunneling, at least in some versions). ExpressVPN also makes a custom router firmware that does it, but it’s by device and not by app. Why is it that while running my VPN on windows and using a ip locator i see that the vpn has successfully transferred my ip to that of the vpn yet when i open kodi on my windows and go to settings system information i then see my actual ip ? Your ISP won’t know that you’re using Kodi if you’re connected to the VPN. Thanks. The info on this page helped me. But I am still facing an issue in kodi – is there a way to automatically switch spoofed country location ie. this addon requires location set to usa but this one requires italy when used? Connect to the VPN server in a country that you want to spoof. Are there any router options that run VPN’s so you can just secure, spoof location, and encrypt your whole networks traffic? DD-WRT and Tomato are both free firmware for routers that support VPNs. ExpressVPN also sells pre-configured routers with its custom firmware, but for its own subscribers only. I am a fair newbie to Kodi and using a VPN at home. I was watching a show on Australian TV Plus 7 and was more than half thru the series when I started getting errors on Kodi. It varies from geo blocked to error playing video. I am running Kodi 17v1. I have the TOR browser and OpenVPN. I tried Tor browser with Open VPN, I tried Kodi with Plus 7 addon. I tried IE only logged into OpenVPN Australia IP. My head is spinning backwards with all the info I am reading. I know there is a lot more to learn and I am willing. Does this simple info allow you to forward me to a forum that might have info. I am not real educated on how to grab the logs but if that is necessary for you help. i will figure that out and submit. Fingers crossed. Tor browser is unnecessary for Kodi if you have a VPN and will just slow things down. I have two Kodi STBs. On one, I have Opera VPN installed and it works just fine, running in the background during all the time the box is powered up. On the other STB, the VPN only runs so long as I am connected to the app. As soon as I move away from it, for instance, to watch content, the VPN drops off. As soon as I return to the app, I have to reconnect to Opera VPN. I have tried other VPNs with the same result so the problem is not with the VPN but I suspect with the Kodi STB. Any suggestions on how I can get the VPN to run in the background when I move off the app? I have two Kodi STBs. On one, I have Opera VPN installed and it works just fine, …..
I’m not sure what OS your STBs run on so I’m not sure. You could set up a virtual router on a laptop, connect your STB to the new wifi hotspot, and connect the laptop to the VPN. Or you could configure the VPN on your wifi router if it’s compatible. Just setting up the VPN on your Macbook should work fine. You only need to configure the VPN on your router if your Kodi device doesn’t support VPN apps.